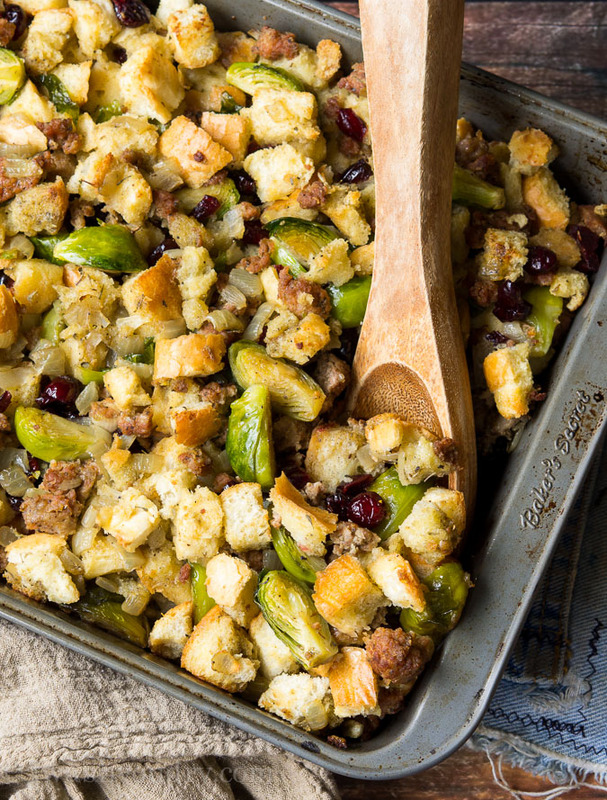 This Brussel Sprout Stuffing is a delightful side dish that is loaded with chorizo sausage, cranberries and buttery brussel sprouts. It’s a winning recipe that the whole family will enjoy! I’m extremely excited and humbled to be partnering with Challenge Butter again this month. As you know, I’m one of their brand ambassadors, so not only do I get to create delicious, dairy-infused recipes such as this one, but I also get to be a part of a larger campaign to help build awareness of the child malnutrition crisis and to help provide aid to hundreds of children in need. This year Challenge Butter has once again joined forces with UNICEF to help not only build awareness, but to also provide nutritious meals to malnourished children. Malnutrition is not merely a result of too little food, but of a combination of factors: insufficient protein, energy and micronutrients, frequent infections or disease, poor care and feeding practices, etc. Undernutrition puts children at greater risk of dying from common infections, increases the frequency and severity of such infections, and contributes to delayed recovery. Did you know that poor nutrition in the first 1,000 days of a child’s life can also lead to stunted growth? This does irreversible damage to a child’s body and brain, and is associated with impaired cognitive ability and reduced school and work performance. Proper nutrition is mega important for these youngsters. I know it can feel daunting when you think about all the children in the world that need help. Right now through December 31, 2014 Challenge will donate a meal for a child in need to the UNICEF foundation for each recipe pinned from its “Pin a Recipe, Feed a Child” Pinterest board. Challenge has committed to provide up to 75,000 meals through this campaign. Want to do more? You can donate directly to UNICEF right here. Let me tell you about this glorious stuffing. I sautéed the brussel sprouts in Challenge Butter along with some diced onions until they were soft and tender, then I combined them with crumbled chorizo sausage and plump cranberries. 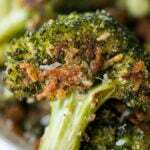 The combination of herbs and spices with the sautéed brussel sprouts is a true winning dish. My whole family enjoyed this one, even the kids! 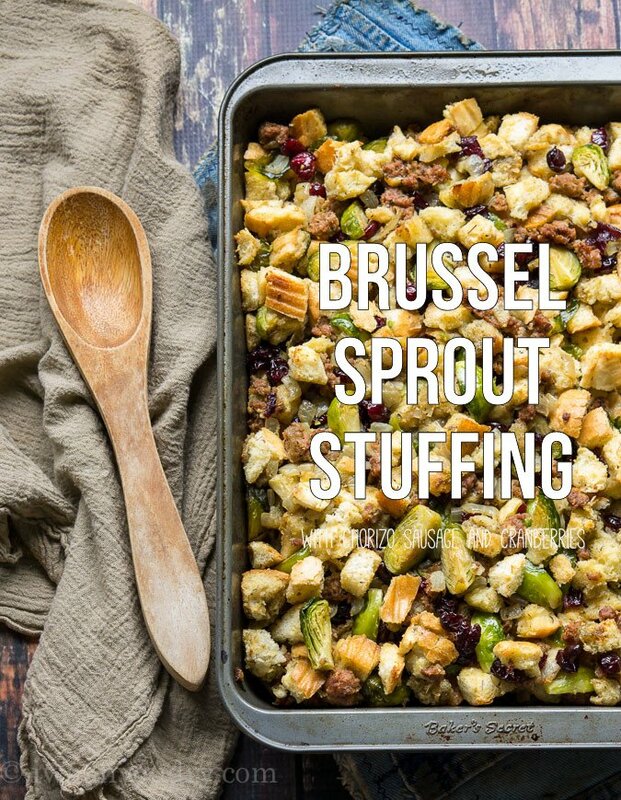 Brussel Sprout Stuffing is a side dish loaded with chorizo sausage and butter brussel sprouts! 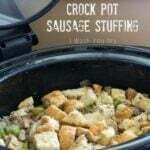 Preheat oven to 300 degrees F. Lightly coat a 9×13 inch casserole dish with non-stick spray, set aside. Line the bread cubes in a single layer on a large baking sheet(s) and bake for 10 minutes. Remove from oven and let cool. Place the bread cubes in a large mixing bowl, set aside. Increase oven’s heat to 350 degrees F.
In a large skillet cook the chorizo sausage, breaking up with a spoon to crumble. Once fully cooked remove from pan to a paper towel lined plate. Wipe out skillet and return it to the stove. Add the butter to the skillet over medium heat. 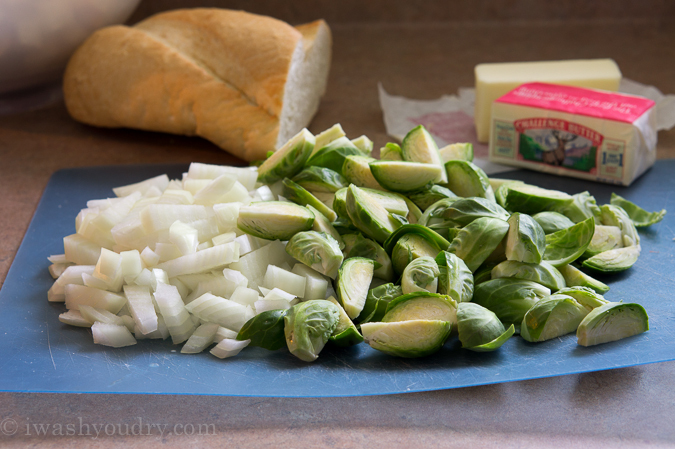 Once it’s melted toss in the onions and brussel sprouts, stirring occasionally, until the vegetables are soft and tender (about 5 to 7 minutes). In a small bowl whisk together the eggs, broth, and seasonings. Combine the sautéed veggies with the bread cubes, add in the chorizo sausage, broth mixture and cranberries. Gently stir until the mixture is evenly coated. Transfer to the prepared casserole dish. Bake for 30 to 35 minutes, or until the top is a light golden brown. Enjoy! Disclaimer: I am proud to be a compensated Challenge Dairy Ambassador. All thoughts and opinions stated here are 100% my own. Thank you for supporting the brands that make I Wash You Dry possible. There are always so many side dishes I want to make for Thanksgiving. This hybrid not only combines two awesome things but would leave room for more of the other sides! Ooooooooh! I love this as I’ve been looking for a chorizo stuffing to make this year. Love the addition of Brussels and dried cranberries, too. I think I may have found THE stuffing recipe I’m going to make this year. Excited! Adding this to my must-try soon list! So delicious! I really need this stuffing in my life. I love brussels sprouts. Pinned! I read the title and thought Mmmm how is she going to do this. Well you surprise the heck out of me how you did it. Great combo of flavors and textures. I didn’t think I would like it frankly. BUT I am a woman and it’s my birthright to change my mind. So I am. I think I really really like it. You’ll LOVE it! The flavor really is incredible. 🙂 Thanks Carol! This looks so amazing!! I could eat a whole dish by myself. What a great cause to help! Thanks for helping to spread awareness. And thanks for sharing this gorgeous recipe! 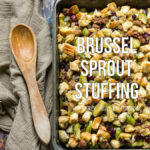 I’m a big fan of Brussels sprouts and this stuffing is right up my alley! 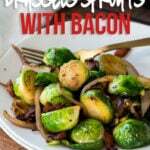 I LOVE Brussel sprouts, and this sounds wonderful! Since there is only one of me in the house I’ll cut it in half, since not sure how it would freeze for later. Thank you and can hardly wait to try it. Love this stuffing Shawn! Looks amazing! My family loves brussel spouts, except for myself. However, I make them those little green cabbage looking things every couple of weeks. I love this idea of a new way to serve them up!